Whenever someone asks me where in the world my greatest thrift/vintage finds have been, there are a few cities that stand out: Los Angeles, Berlin, and Manchester. The northern English city of Manchester can only be described as a mecca of vintage (watch this haul if you don’t believe me). So, just as I have done for Los Angeles, Lisbon & Porto, Portugal, Portland, and Berlin, I thought it was about time I wrote down a list of my favorite thrift and vintage stores in Manchester so that you can bookmark this page for the next time you find yourself floating about there with some free time and an overflowing purse. For thrifters and non-thrifters alike, the Northern Quarter should be your first port of call. This area is Manchester’s creative heart with a plethora of independent cafés, bars, record shops, and fashion stores. With the majority of shops spread along three streets, the Northern Quarter offers shoppers a network of roads where the best vintage shops in the city can be found within a few minutes walk of each other. Hands down my favorite vintage store in Manchester, We Are Cow is where I have found the majority of my goodies during past trips. The two-floor store is brimming with incredible vintage pieces including re-worked garments, 90s ditsy floral dresses, 70s velvet shorts, 80s ballgowns and anything else your vintage-loving-heart could desire. We Are Cow also has stores in Birmingham, Liverpool, Manchester, Nottingham, and Sheffield (potential real-time thrift haul destinations?? ), as well as a fantastic online store. Pop Boutique has a pretty legendary story in the world of vintage selling. In 1983, Richard Free decided to start a business selling vintage clothing until he found a “real” career. After two years of traveling up and down the country selling his finds, he opened his first shop in Affleck’s (see below), and then the second one in Liverpool. In 1991, he was approached by the Topshop in Oxford Circus to be the first company to sell vintage clothing in their renowned flagship shop. In 1994, the first Pop Boutique opened in Manchester (this one!) which has since been followed by stores in London, Liverpool, Leeds, and Gothenburg, Sweden. They also design their own collection of vintage-inspired pieces which are stocked all over the world and can be purchased online. The store in Liverpool is terrific; but, the Manchester branch is really something else. Eveything is meticulously selected by a team of vintage lovers and their attention to detail ensures that only the best quality and most exciting styles make their way to the rails. 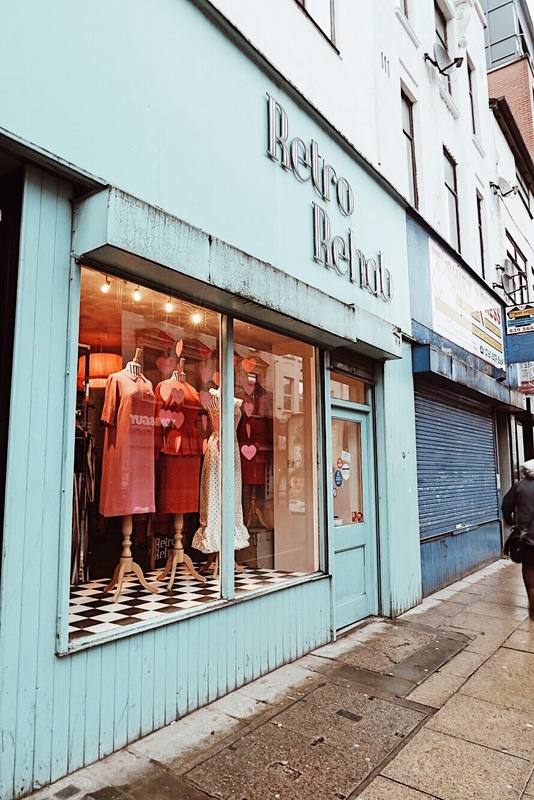 Given that it is the only store in Manchester featured on The Telegraph’s list of the best vintage boutiques in Britain, it should come as no surprise that a couple of hours in Retro Rehab was at the top of my priority list. Specializing in dresses from the 1940s to the 1980s, the store is a goldmine of elegant cuts and stunning embellishments. Their pieces are sourced from all around the world, while the re-worked garments are delicately crafted to construct something exquisite. I found the most beautiful purple and green dress from Hong Kong while I was there, as well as a funky pleated knee-length skirt and a ridiculously fabulous turban — all of which can be seen in my haul! The concept behind Oxfam Original is that they stock a more premium selection of high-street, designer and vintage garb than the your regular, local Oxfam. While I didn’t see too much that was my style — I only came out with a vintage neck-scarf — I still think it is worth popping into because it is on the smaller side enabling you to easily do a quick scan. On the day that I was there, I saw mainly unworn high-street pieces, rather than any actual designer stuff; however, as we know, every day is different when it comes to thrifting and vintage shopping. This emporium of eclecticism is the ultimate Northern Quarter institution. Formerly a department store, Afflecks is home to over 70 independent indoor market stalls and attracts around 24,000 people per week! The four floors are filled with a wide variety of stalls selling clothes for men, women, and children. In addition, there are stalls selling skateboards, pipes, posters, condoms, homewares, and even a tattooist. Some of the more quirky stalls include a store selling items adorned with photos of the crazy road signs around Britain, a business solely selling Viking and Celtic themed jewelry, and custom glass engraving. There is also a store dedicated to fudge (aka where you can find me). Even if you don’t intend on spending any money, it is still worthwhile to wander around Afflecks as it is a seriously unique shopping experience. A small but very well stocked Oxfam right by the University of Manchester, this store is often brimming with students who come in regularly for their college closet updates. I found the most incredible ASOS sweater here, as well as a couple of other bits and bobs; so, while it may be small, it is indeed a gem. If you are by the University or have just visited the Whitworth Art Gallery, take 30 minutes to have a browse. Thrift Shop Manchester is probably the best place on this list to grab yourself a total bargain. Here you can often get 3 items for £10, while individual pieces are around £4! Unlike the rest of the stores on this list, this one has basically no organization system — so definitely geared more towards serious thrifters. A suggestion from my Couchsurfing host, Goodstock Manchester has four floors worth of goodies, including a massssssssive dress section that had me googly-eyed. Goodstock Manchester is run by V-Inspired, a volunteering charity that assists young people in England in finding opportunities to volunteer and give back to their community. 100% of the sales from Goodstock go towards V-Inspired. It is a really cool, fresh take on the charity shop and I recommend reading more about it here. Let me know in the comments where you would like to see me go vintage shopping next!